This is a very high free-fall and cascade with an open, south exposure. It'll dry to a trickle during drought, but a small plateau and pond up above ensure that at least some water should be running. Looks best during high flows, however. Take I-26 East from Asheville or I-26 West from I-85 to the exit for Columbus, NC, Hwy. 108. Go just under 1/2 mile and turn left on Houston Road, at a stop light. Go about 1/2 mile and bear right, still on Houston Road. Go just over 1/2 mile and turn left on to White Oak Mountain Dr. (not the housing development). It is just under 2 miles to the waterfall on the right; a small pulloff is just ahead on the left - big enough to park about one small car. A far away, but decent view of the falls can be found in downtown Columbus, from point such as the Food Lion parking lot, especially in the winter and in wet weather. Located right next to White Oak Mountain Dr., so you can see it from your car or walk back down from the pull-off to see it up close. 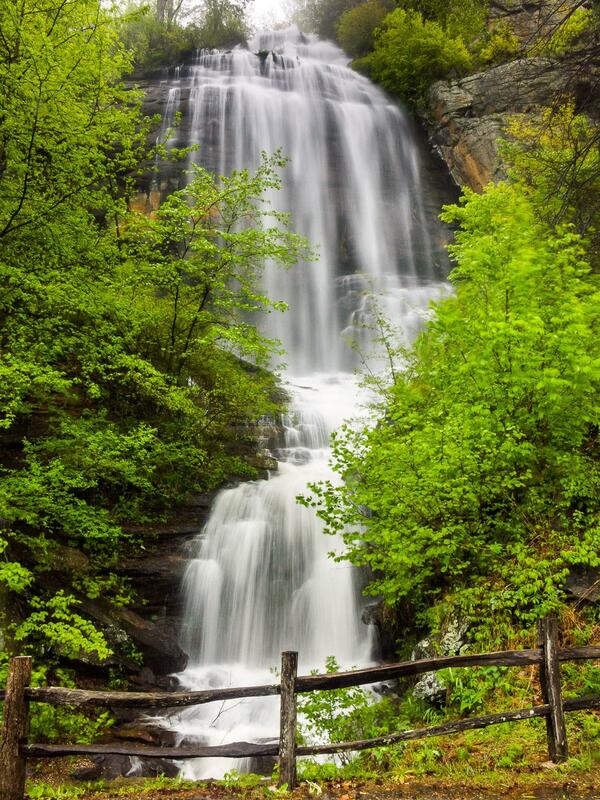 The falls is on private property, so stay on the road right-of-way while viewing it.